On March 29, 2018, major automotive industry players gathered for the third-annual Women & Automotive Canadian Leadership Forum at the Westin Harbour Castle in Toronto. The attendees consisted of revolutionary leaders and risk takers, focused on advancing women into roles of leadership in the Canadian automotive industry. Eddie McWhirter, LGM’s Executive Vice President of Finance, was one of the 16 women profiled who exemplify leadership in our industry. 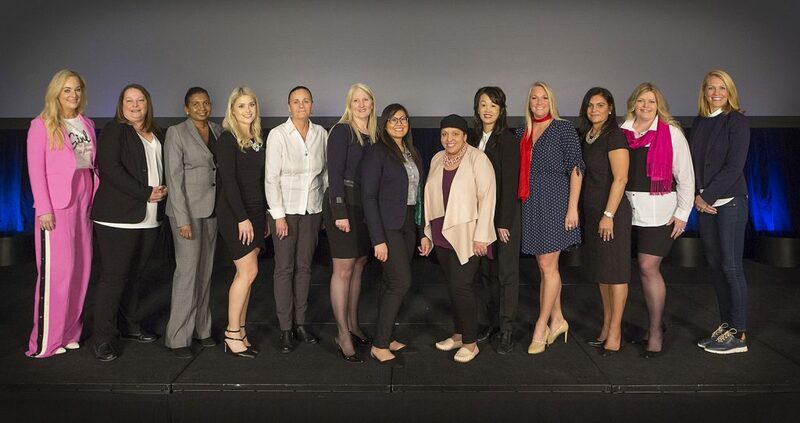 Pictured: The women recognized through Profiles in Leadership at the 2018 Women & Automotive Canadian Leadership Forum in Toronto. McWhirter was thrilled to participate in a panel discussion with a focus on mentorship, where she was able to share her experiences as both a mentee and a mentor. A big focus of the conference was on leadership, mentorship, and empowering women to push through the glass ceiling. As a keynote panelist focusing on mentorship, McWhirter emphasized the importance of mentorship for both the mentor and mentee and that there is always a support system in place for those who seek it. She encourages ambitious women to open themselves up to the opportunity of building relationships that could lead to mentorship, and to make it known to those that inspire them. McWhirter feels that what’s most rewarding as a mentor is the ability to give back, support someone who wants to grow and learn from you, as well as the acknowledgement of what you have to offer as a mentor. For the mentee, what’s most rewarding is the ability to increase confidence and interpersonal skills and to take control of his/her career. She also explained that mentorship can evolve organically through building relationships, it doesn’t always have to be a structured corporate program. The highlight of the conference for McWhirter was simply to be in the company of successful, passionate women who not only want to succeed, but also want to bring other women along instead of competing against them. She was delighted with the number of great connections and friendships made throughout the day that will foster a great support network.